Last Sunday, a friend and I were having an animated discussion about where in Delhi one goes for the best butter chicken. Rahul said Mini Mughal; I said Swagath. Many other suggestions came up and were shot down. Both of us thought that Moti Mahal had no consistency between branches; that dhabas got the dish wrong by adding too little cream and five star restaurants by adding too little tomato. Both of us approved of the Minar version and discovered that we made mental ratings of restaurants based on the quality of their butter chicken. We were brought down to earth by our third friend (a non-Punjabi Delhiite) asking us exactly what was so great about butter chicken. “Why has this upstart dish become so popular, so soon?” was how he put it. That got me thinking. And this is my theory of how butter chicken earned its stars. I’d love to know if you agree with me. Before Partition, nobody seems to have heard of it or tasted it. 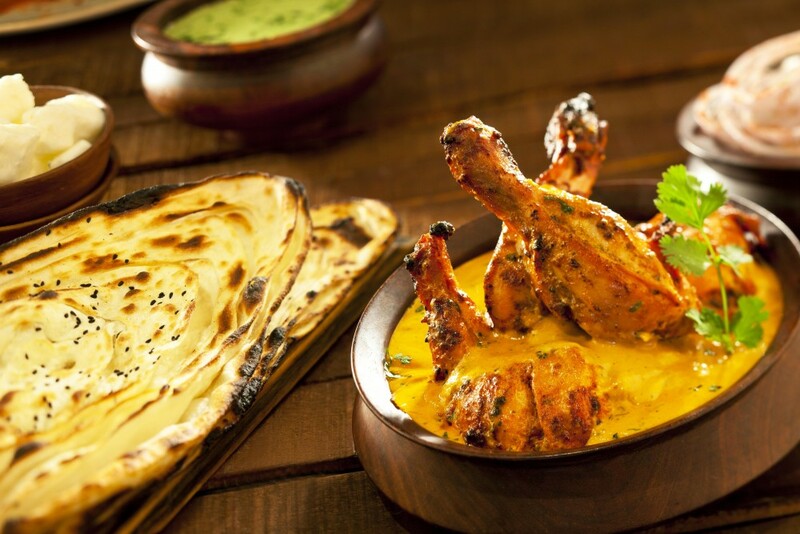 Very soon thereafter, it was touted as one of the stars of restaurant menus in North India. The only reason I can think of is that it had the optimal blend of exotica and familiarity. Butter chicken – exotic? All I can say is that in the 2000s, sushi is considered exotic by the same people who took to butter chicken with fervour. In the 1940s, chicken that had been lightly grilled in the tandoor and then put into tomato gravy was unheard of, and so it was exotic. There was no dish quite like it in the annals of Punjabi food – or of any other North Indian cuisine either. To become popular, a new cuisine needs to have a perfect blend of novelty and familiarity, and butter chicken had that magic combination. Today, it has become comfort food for the children and grand-children of those first-time eaters of the dish. The second factor is its simplicity: tomato paste, cream and tandoori chicken, with light spicing that does not include turmeric, and so, stands outside the pale of everyday home food with its boring connotations. The third reason has to do with the ingredients themselves. Chicken, as every non-vegetarian Indian knows, is the most popular meat around the country. Cooked tomatoes have loads of umami, the famous fifth taste. It’s the most sought after taste, yet the most difficult to define, but I would say deliciousness is a good way to describe it. Cream, as a dairy produce, is dear to the hearts of most of Delhi, Haryana and Punjab. Butter chicken has a winning formula; how can it not be popular? Chef Manu Mohindra of Under One Roof refines my theory further by saying that any dish that is simple to cook and good to taste becomes a winner. The example he points out is momos, now the street food of choice of much of Delhi. The more it becomes available, the more its popularity grows. Quite like butter chicken in fact.